Pyongyang, December 3 (KCNA) -- Respected Supreme Leader Kim Jong Un gave field guidance to the Amnokgang Tire Factory which successfully carried out the task for producing tires prioritized by the Workers' Party of Korea (WPK). He shook hands with each official and thanked them for their trouble, saying that the workers of the factory solved the issue desired by the Party and gave great courage to him by making collective innovations in a drive for building new tires, and that he came to thank them. He looked round the room for the education in the revolutionary history. He underscored the need for the officials and workers of the factory to bear in mind the pride and honor of living and working at the glorious factory which was associated with warm love of President Kim Il Sung and leader Kim Jong Il and to bring about fresh miracles and innovations in production, so as to add eternal luster to the undying leadership exploits performed by the great leaders for making the industry of tire Juche-based. He went round all kinds of tires made at the factory and the newly developed large-size tires ready for the ballistic rocket self-propelled launching vehicle. He gave the task of manufacturing without fail the large-size tire for the 9-axis self-propelled launching vehicle of our own style to the factory in September while he energetically guided preparations for a "great event in November". The officials and workers brilliantly carried out the order given by the Party by waging a courageous production campaign despite bottlenecks and difficulties under the uplifted banner of self-reliance. 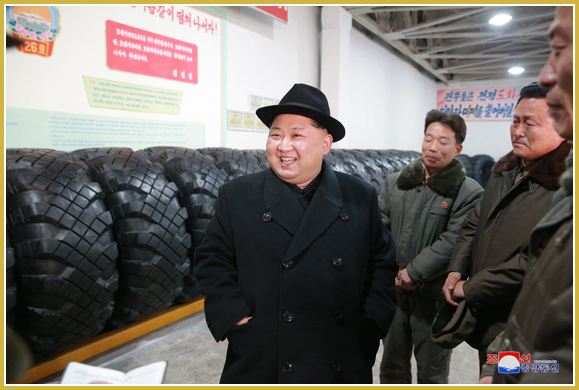 The Supreme Leader said he was greatly impressed to see the fighting spirit and working manner of the officials and workers who had established the new production process of large-size tire with domestic products, not depending upon imported equipment, in a revolutionary way and in a short time, and manufactured the new-type large-size tires, far superior to imports in their physical and mechanical properties. He expressed deep thanks to them in the name of the Central Committee of the WPK. He went round various places of the factory to learn in detail about production and management. He gave valuable instructions over the management of the factory. The tasks facing the factory included the issue of raising the production to a higher level by properly organizing economic work to meet the requirements of the present stirring times in which victorious advance is accelerated on all fronts of socialist construction, the issue of newly designing and upgrading the production process according to the trends of tire industry developing worldwide, the issue of pushing ahead with the supply of raw and other materials for putting production on a normal track, the issue of preparing the employees as intelligent workers equipped with modern scientific and technological knowledge and the issue of paying deep attention to the work for providing the workers with better living conditions. He said that it is necessary to turn out automobiles and other vehicles and manufacture all sorts of tires for them by our own energy, technology and materials, in order to satisfy the daily-increasing needs in developing the country's economy and beefing up national defense capabilities, and therefore the factory must be upgraded to be state-of-the-art one in line with the requirements of the era of the knowledge-based economy. The Supreme Leader expressed expectation and belief that the officials and workers of the factory would proactively contribute to implementing the WPK's line of simultaneously developing the two fronts, and had a photo session with labor innovators. Accompanying him were Choe Ryong Hae, member of the Presidium of the Political Bureau of the Central Committee of the Workers' Party of Korea, vice-chairman of the State Affairs Commission of the DPRK and vice-chairman of the C.C., WPK, and Hong Yong Chil, Jo Yong Won and Yu Jin, leading officials of the C.C., WPK.